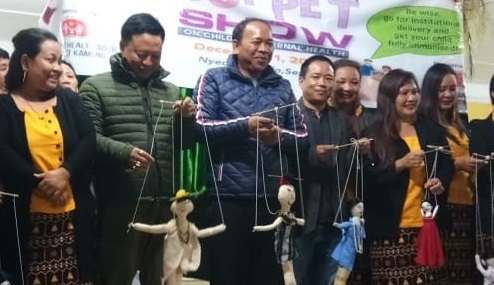 The dwellers of Seppa town in East Kameng district of Arunachal Pradesh on Saturday witnessed a string puppet show which was organized on the occasion of Indigenous Faith Day celebration at the Nyedar Namlo hall. The puppet show was organized by the Women Welfare Organization (WWO), East Kameng, in collaboration with the East Kameng district health society to generate awareness on ‘family planning, child and maternal health’ to reduce maternal deaths, child mortality, and to improve family planning. The 15-20 minutes duration of puppet show in Nyishi language, created awareness on various centrally sponsored schemes like Janani Suraksha Yojna (JSY), Janani Shisu Suraksha Karyakram (JSSK), Pradhan Mantri Surakshit (Matritva Abhiyan PMSMA). Awareness on Incentivization of Full Immunization (IFI), a State sponsored scheme, was also held. Thrizino-Buragaon MLA Kumsi Sidisow and Seppa West MLA Mama Natung graced the event as chief guest and guest of honour respectively. “We are planning to conduct similar programmes especially in the rural areas of East Kameng district to spread awareness on health, education, and other social issues faced by women and girl child,” informed Mone Singhi Taba, president of WWO East Kameng. Having received a positive response from the audience, a delighted Moni further said that it wasn’t an easy task to carry out the puppet show. “Since our members lacked experience in puppetry it took a great effort to bring things into line. We have received a positive response from the audience,” she said while expressing gratitude to DHS for entrusting them with the job. Seppa Government Model College principal Robin Hissang, Bameng BDO Chagam Dolo, DRCHO Dr Dirang Pizi along with other doctors and staff of DHS, HoDs, women NGOs, SHGs, and people from different communities residing in the township witnessed the show.